While the idea of having translation, traditionally seen as minor and servile, serve as the plot for an exciting movie might surprise some, it is certainly not the first film to do so. For example, back in 1963, Audrey Hepburn already played the role of a simultaneous interpreter in her hit film Charade. In fact, in Translation goes to the movies, Michael Cronin debunks the myth of the translator’s invisibility by analyzing their prominence in Hollywood mainstream and other successful box-office films and foregrounding their cultural contribution: “An awareness of the wealth of attention to the fact of translation contact in cinema and the multiplicity of translation sites challenges the more baleful readings of globalized popular culture as the inevitable prologue to the death of diversity.” Recent examples of this theme include Lost in Translation (2003), The Interpreter (2005), The Railway Man (2013), and Arrival (2016), all of which explore translation’s possibilities and pitfalls in our highly interconnected world. Earlier this year, Wes Anderson’s Isle of Dogs nailed it with a humorous depiction of the fallibility of translation. According to Moeki Fujii, in her review for The New Yorker, “this is the beating heart of the film: there is no such thing as ‘true’ translation. Everything is interpreted. Translation is malleable and implicated, always, by systems of power.” And we recently got a taste of this in real life as well. If art imitates reality in Roinsard’s film, truth can sometimes be greater than fiction too. In the last few months, translators and interpreters have been in the spotlight of the Trump-Kim Korea Summit media coverage, for example, and there has been a lot of debate too about whether Congress can subpoena the interpreter from Trump’s meeting with Putin. Thus, understanding the role that translators and interpreters play in our current world and its configurations of power, becomes a political responsibility, and cinema can certainly help here. In addition to the most recent fiction films, there have also been a handful of documentaries from non-Anglophone centers that shed a different light on common representations of translators as cultural mediators, while problematizing the metaphor of translation as gap bridging, and revealing the more political nature of translation. These films let us take a peek behind the curtain of the translation process and into the minds of its protagonists, the translators. Die Flüsterer [The Whisperers] (2005), by David Bernet and Christian Beetz, is a German documentary named after the “chuchotage” interpreting technique, often used in diplomatic settings and business meetings, by which the interpreter whispers the translation into the ear of the person in need of language assistance. But in this film, like in the other documentaries, the interpreters don’t actually whisper. On the contrary, in fact, they tell their stories, speak, and they do it out loud and in the first person. And this is perhaps the biggest contribution these documentaries make; they foreground translation’s importance by focusing on real-life translators, showing their day to day working lives and portraying their task in all its complexity. By way of interviews, Die Flüsterer thus follows the stories of different generations of interpreters, from the young Nathalie Reichert, an interpretation student about to take her final exams to Patricia Vander Elst, an older woman who interpreted at the Nuremberg trials. The film also includes Angela Drösser, a simultaneous interpreter with ample and varied experience ranging from a sprinkler convention to the press conference for the arrest of Saddam Hussein. In every interview, we learn more about the people in the cabin, the personalities behind the voices in the headphones. Vander Elst expresses her concern about having to interpret for someone whose ideology she doesn’t share and Reichert worries about how stress and nervousness can affect her voice and wonders if her listeners notice it. Translators are revealed as humans, and their fears are in fact justified. Simultaneous interpretation can be nerve-wracking and definitely much more than “just talking,” as one of the interpreters tries to explain to his father, when he teases him about his chatty profession. This becomes evident in one of Drössers last interviews, when she recounts her experience interpreting at the press conference for Hussein’s arrest. The speaker is listing the items recovered from his Hussein’s hideaway: money, weapons, ammunition, food. And then, all of the sudden and out of the blue “a white and orange taxi.” Drösser is stunned, but she says the words anyway. Turns out, there was indeed a white and orange taxi recovered from the scene; it was the car that had taken him there. A happy ending for the interpreter, but not an uncommon situation that might have just as easily turned into a diplomatic dispute. “Translation is the silent waiter of linguistic performance: It often gets noticed only when it knocks over the serving cart,” wrote Mark Polizzoti in his recent NYT piece “Why Mistranslation Matters?”. But if interpreters can cause conflict (Polizzoti remembers Khrushchev’s Cold War infamous statement “We will bury you”), they can likewise help fight it too. The Romanian documentary Chuck Norris vs. Communism (2015), by Ilinca Calugareanu, tells the story of a translator who risked her life to change the lives of others through the power of film and translation. Twenty years into the dictatorship of Nicolae Ceausescu, Irina Nistor challenges the culturally isolated and highly surveilled Romania by single-handedly dubbing thousands of Hollywood films that were banned by the regime, including Dirty Dancing, Top Gun, Last Tango in Paris, Pretty Woman, Back to the Future, and, of course, all of Chuck Norris’ adventures. This documentary, available on Netflix, also tells the stories of the men and women who grew up with her, and whose interviews make up for the majority of the film. Resembling her task, Irina Nistor remains just a voice-over throughout the film; the re-enactment of her story played by an actress. But it was, in fact, her voice everyone in Romania knew. One of the interviewees goes as far as to say that it was the most well-known voice in Romania after Ceausescu’s. This translator’s invisibility becomes even more palpable, as people grew up fantasizing about what she must have looked like. Some of the interviewed men swore she sounded like a blonde, others paradoxically described her as “an entity” who “had a certain presence.” But above all her voice was for the Romanian people unmistakably associated with freedom and hope. In clandestine screenings, her dubbing allowed viewers to realize there was another way to live. Illegal video nights were not only formative for many young people at the time, but also a way to survive, to cope with the regime, to escape, if only imaginatively through the cinematic medium to another reality. In this documentary, the effects translation can have become evident and worthy of the risks the translator took. A double agent of sorts, Nistor worked a day job as a translator for the Romanian state television where she was part of the Ideological Commission, a censorship committee that decided what to broadcast and what to cut. At night, she worked for the subversive Zamfir, who imported and distributed banned films where Irina was finally free to say inflammatory things for the Romanian regime like “priest,” “God,” “Christmas” and, of course, “stinking communist.” It is only at the very end of the documentary that her real identity is revealed, her face lit up by a faint light coming from a window. She is, in fact, blonde and most definitely has a presence. Irina Nistor is like a superhero, and for many, she really was. Like Chuck Norris fighting the bad guys, through translation she fought repression and censorship, it was Irina Nistor vs. Communism. If dubbing was the political subversion that could have cost Nistor’s life, translation for Svetlana Geier meant survival, as she learned German in her native Kiev to withstand the Nazi invasion, for which she became a translator. Die Frau mit den 5 Elefanten [The Woman with the Five Elephants] (2009) shows her over half a century later, after having dedicated two decades to translating Dostoyevsky’s quintet of great novels, the five elephants. The documentary by Vadim Jendreyko, which is available for purchase on YouTube, follows her first trip back to Ukraine in fifty-six years. Her quiet family life as a translator in Germany offers a stark contrast to the horrors of her previous life there. In what makes for a complex identity paradox though, she owes and has dedicated her life to what her mother called her “dowry,” i.e. the German language. Fidelity in translation is already a contested concept that becomes even trickier after adding national and political affiliations. Literary translation can be a kind of political resistance and agency, yet the implications of translating into the enemy’s language are never addressed in this film. In a haunting scene at the end of the documentary, she sits next to a pile of the five elephants, dense works as tall as her torso. Her dedication is undeniable: “a text like this is inexhaustible (. . .) but suddenly something is there that one has never noticed before,” she reflects. Geier’s paradoxical task gradually becomes yet another elephant in the room. In another compelling cinematographic frame, the interviewees in Israeli director Nurith Aviv’s documentary Traduire (2011) stand in the corner of a dark room, their names appear on the screen as the light enters through a window lighting up the scene, revealing their faces. They are translators emerging, quite literally, from darkness, out of their invisibility, to the center of the narrative. They all speak in their own tongues, making this documentary a truly polyglot exploration of translation including French, Spanish, German, Italian, Lithuanian, Hebrew, and English. In this third and final part of a trilogy that explores language and linguistics, Aviv focuses on translation, as she interviews a wide variety of Hebrew translators, “modest titans laboring to open up new routes for a language that is historically, theologically and politically loaded” (Jaques Mandelbaum). With projects ranging from biblical texts and medieval poetry to a dictionary of Hebrew idioms in Yiddish and Israeli playwriting for a Palestinian audience, Traduire honors the action embedded in its French title, the verb “to translate.” In this documentary, translation is depicted as a progressive and creative process, the formative and transformative experience of developing one’s own voice, much in the same way Israeli writers had to self-translate themselves into Hebrew for the creation of a national literature and, therefore, a national identity. In the first person and looking straight into the camera, the translators do not mourn what’s lost in translation, but rather reveal how they have found themselves thanks to it. Key world-players, subversive activists, survivors, nation builders; these documentaries do justice to the breadth of political implications translators and interpreters can have, whether working in diplomatic circles, or in literary and audiovisual translation. 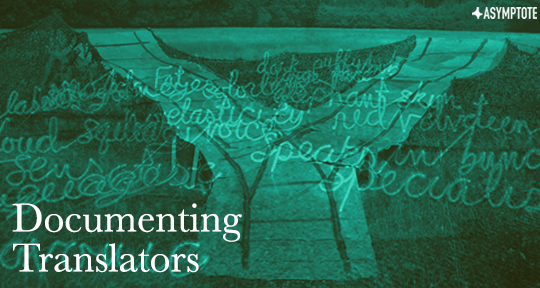 While depicting the lives of accomplished and empowered translators, their first-person narration also opens up new avenues for thinking about the fragility of the translation process, the vulnerability of the translator’s position, the magnanimity of the translator’s task, and the dedication behind the translator’s vocation. By documenting their working lives, these films ultimately pay tribute to the heroes of these stories, those working backstage; they make protagonists out of the ultimate supporting actors in history, the translators. Denise Kripper is Assistant Professor at Lake Forest College. She has a PhD in Literature and Cultural Studies from Georgetown University and a BA in Literary Translation from her native Argentina. She lives in Chicago, where she’s a member of the Third Coast Translators Collective.